A high-level meeting on the crisis will take place in Brussels tomorrow morning. 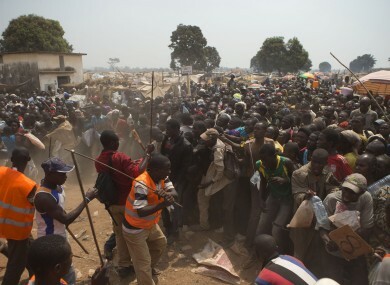 Security volunteers use sticks to fend off the crowd trying to enter a food and supplies distribution point, at a makeshift camp housing an estimated 100,000 displaced people, at Mpoko Airport, in Bangui, Central African Republic. THE NEED FOR stronger international action to help end the humanitarian crisis in the Central African Republic has been underlined by Minister for Trade and Development Joe Costello TD today. Yesterday, fresh fighting was reported in the CAR as the deadline closed for candidates seeking to be chosen by parliament as the new interim president. There were reports of “some violence nearly everywhere”, with people being “in a desperate situation” and worries that it would get even worse as the election approaches. Some 4,400 African troops and 1,600 French soldiers have been deployed to the CAR to try to restore order in the impoverished country that was plunged into chaos and sectarian violence following a March 2013 coup. Minister Costello was speaking before a high-level meeting on the crisis that is due to take place in Brussels tomorrow morning. It will bring together representatives from EU member states, neighbouring countries, the UN and NGO to discuss the issue. Minister Costello noted that he recently announced funding of €2 million to the UN to support its efforts to provide the most vulnerable in the Central African Republic with food, water, shelter, healthcare and education. “This brings Ireland’s total contribution to the UN’s Common Humanitarian Fund for the Central African Republic since it was established in 2008 to €14 million,” he said. He said that the crisis is affecting the country’s entire population, and “they need the support of the international community not just now but into the future, if we are to prevent the violence of recent months from happening again”. Costello said he is “gravely concerned at the impact of the violence on children”. I call for all those who have perpetrated acts of violence against civilians and contravened international human rights law to be held accountable without delay. He added that he hopes tomorrow’s meeting will help to focus the efforts of the international community. At the meeting, a wide range of stakeholders will hear about the impact of the response to date and the challenges faced by humanitarian agencies. Participants will also discuss key humanitarian priorities for the coming months. Tánaiste and Minister for Foreign Affairs and Trade Eamon Gilmore TD is also in Brussels to attend a meeting of the EU Foreign Affairs Council at which the crisis in the Central African Republic will be discussed. Email “Costello calls for "urgent" international response to CAR crisis”. Feedback on “Costello calls for "urgent" international response to CAR crisis”.